Simply put runes are ‘small stones, pieces of bone, etc., bearing symbols with mysterious or magic significance, and used in divination…‘the casting of the runes’. (Oxford English Dictionary). As usual I forgot to photograph my Rune before I started work on it so here it is part way into my design. This is ‘Jera‘ which signifies harvest, year or a fruitful year. Happily Jera is a rune of beneficial outcomes and applies to any endeavour to which you are committed because it involves a time span…no quick fixes here and the ‘year’ aspect symbolises a full cycle before you can harvest your rewards. This rune seems appropriate for me as I have decided that 2018 is going to be a year of creative discovery for me. Although my Rune has its own particular meaning when I started thinking about what to make I wanted to do something that illustrated runes more broadly. I had a hankering to do some embroidery and eventually decided on a removable cloth cover for a notebook…maybe even a spell book. As I said, I haven’t managed to get too far with this so the best idea I can give you of what I had in mind is this dummy version that I sketched the cover for. The idea is that all the runes except Jera will be embroidered on cloth and these will be intertwined with vines and leaves to represent the fruition of the harvest. As you can see, I’ve drilled my Jera rune and used it to make a leather binding for the book…I’m thinking this will be a loose, soft form removable cover that can be moved from book to book. I did manage to get started on the embroidery for the front of the cover by tea staining some calico to give it an aged look and embroidering half the runes on the front and starting on the vines. The rest will go on the back and eventually the vines will weave their way across the entire piece and join up, with the binding sitting centre stage as a focal point. When I started stitching the vines I made them more random than I did on my sketch as that felt a bit to formal and ‘Romanesque’ which didn’t feel quite right. The pen marks are made with an air erasable pen and will eventually fade. And that’s as far as I got but I will let you know how it turns out when it’s finished. Very many thanks to Niky for making these lovely runes for us…I’m very excited to see what everyone else has made with theirs and you can join me on out blog hop using the links below. wow. This is creative out of the box thinking. I have a clear picture of what your intent is and am looking forward to seeing the final outcome. if you are like me it will be slightly different than you planned. (isn’t it always) I havent embroidered in years. your work reminds me of my mom’s and my grandma’s embroidered linens, some of which I still have packed away carefully. You are well on your way to a gorgeous book cover. And the thread you chose….LOVE. Thanks Cathy – the threads are from Olivers Twists…I could bankrupt myself in their shop! Super cool idea! I really love how you used the rune to bind the book and the embroidered vines are SO pretty! 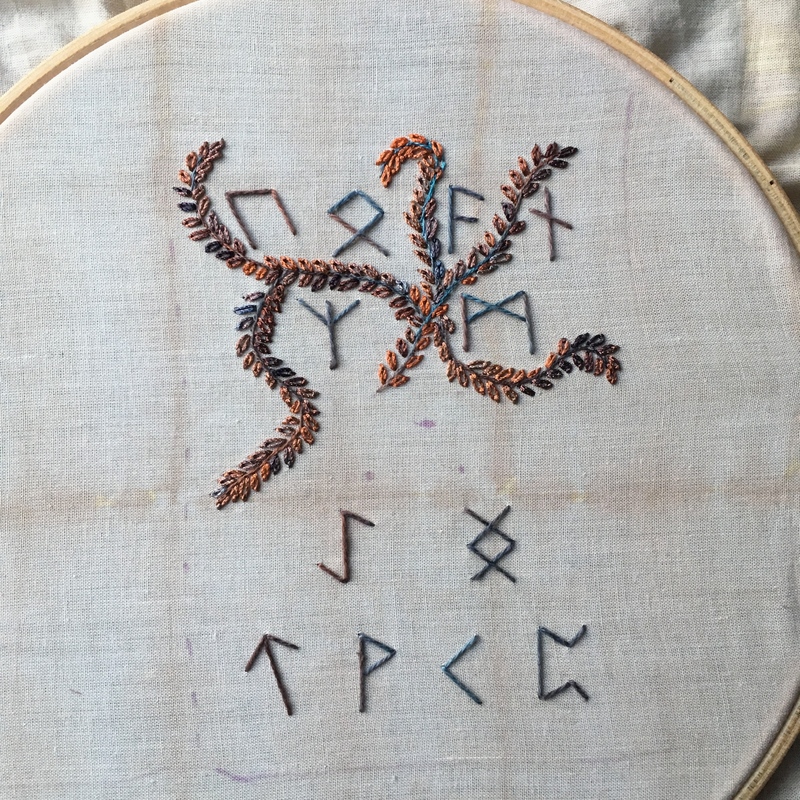 Thread embroidery is such a mystery to me, just like runes! This is so great Lesley! Whoa. That is wicked cool. The colors are great – variegated thread? I cannot wait to see this! Your book cover is going to be beautiful and I can’t wait to see it finished!